Predeceased by her husband Pasquale Scialdone. Survived by her Son Gene (Sherry) Scialdone. Granddaughter Kristine (Christopher) Barrett. Grandson; Mark Scialdone. Great Grandsons; Jacob and Joshua Barrett. Many nieces and nephews, dear friends. Lydia loved baking, cooking for her family and keeping a clean and immaculate home. The family will receive friends for funeral services 10am, Friday October 19, 2018 at Newcomer Cremations and Funerals, 2636 Ridgeway Ave. (corner of Long Rd.) Deacon Larry Feasel officiating. Interment will be held at the convenience of the family. In lieu of flowers, friends may make contributions online to St. Jude's Children's Hospital at: https://www.stjude.org/donate/donate-to-st-jude.html in memory of Lydia. Add your memories to the guest book of Lydia Scialdone. 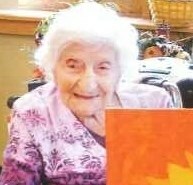 Gene, Sherry, Kris, Mark and family- I just found out about Grandma Scialdone's passing. My sympathy to you all, she was a feisty loving lady with much love for her family. We were saddened to hear of Lydia's passing. It was amazing to be able to connect with our cousin Lydia in the last years of her life. (Thank you Sue Winter!) Our visits in Brockport were such a joy as we discovered photos and family connections with each other. Lydia shared stories about her childhood, her job during WWII, getting married, her cooking(we compared some family favorites), and of course, her pride in her family. She had a wonderful sense of humor. We are very grateful for the opportunity to spend time with her, and hope your own memories bring you comfort and peace. To Gene and Sherri and Kristine and family I am sorry for your loss. But I must say how I enjoyed visiting Lydia and how she always looked so stylishly dressed. Everything matched and always her nails done. You all kept her in the height of fashion so sweet . She loved her twin grandsons and loved how they visited her and kept her in the loop on what they were doing. Her pictures kept her happy too. She will be missed. My dear Lydia I will miss your smiling face and your love and connection I felt whenever I came to visit you. We loved to remember the happier times of when you and my mom were young and growing up best friends forever. You shared stories with me only you would have known about the good times and the sad times while you were children . there for each other. You were my moms maid of honor in her wedding and my Godmother when I was born. That love was always there for you both during the struggles of your young lives . The stories that you shared with me that my mother was never here to tell me. Ironically, my mom has been gone for 44 years this month. I would like to think that maybe one of your angels was my mom coming to get her sweet friend to enter the gates of Heaven. Waiting for you with your love of your life Pat who you have missed for over 50 years. you deserve this reunion of all your loved ones my dear Lydia. No more loneliness no more pain and a full life again able to walk and shop and share happy memories. I will miss you my sweet and wish we were able to take one more trip to Walmart or one more lunch at Brookhouse like we planned so often and one more hug and I love you with butterfly kisses when I left. But I am happy to know you are not alone and as always pray for you with my constant prayer to find peace in your heart and be not afraid for you are finally in Gods house.